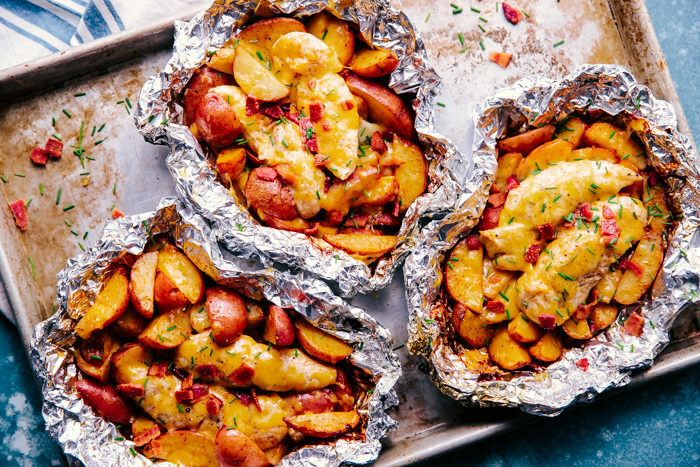 Cheesy Chicken and Potato Foil Packs are a fun and delicious way to turn your next meal into something cheesy, juicy and delicious. No mess and no fuss when it comes to foil packs! If you are in need of some easy and family friendly dinners this Summer that won’t lack in flavor and are easy clean up as well, you need to try Teriyaki Chicken Kabobs, Sweet and Sour Chicken Kabobs, Honey Garlic Bacon Wrapped Chicken Kabobs, or Beef Shish Kabobs. 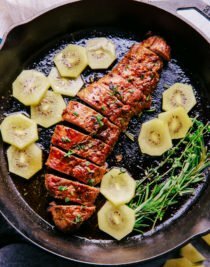 Every Summer I try to out grill myself from last Summer, silly I know, but it keeps my flavor juices flowing to come up with recipes that won’t disappoint even the pickiest of eaters. 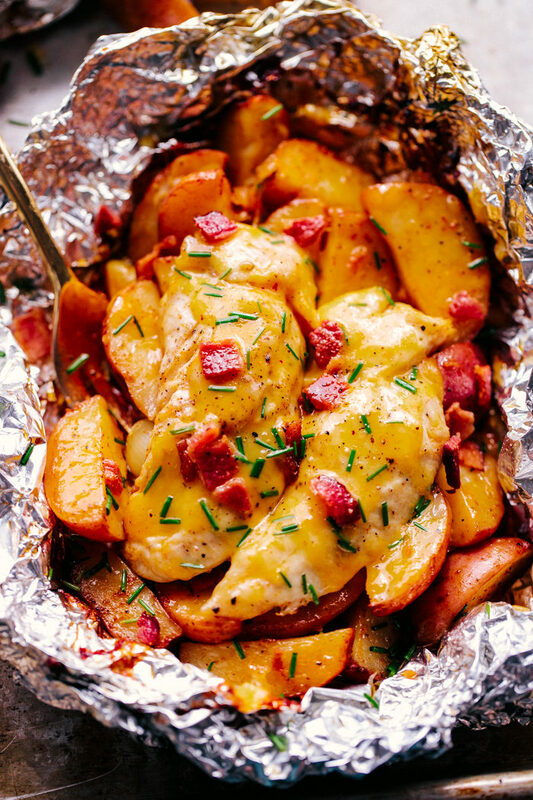 These Cheesy Chicken and Potato Foil Packs have something for everyone to eat and love. The beauty of making foil packs is everything gets cooked in one place at one time, and comes out tender and delicious. Plus, my favorite part besides eating them is the clean up. 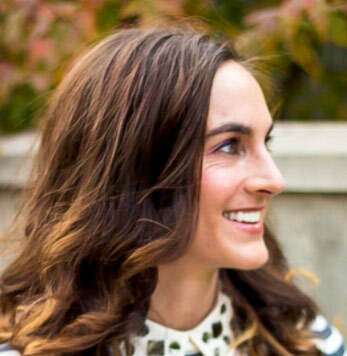 It is as simple as crumbling the foil up and throwing into trash. 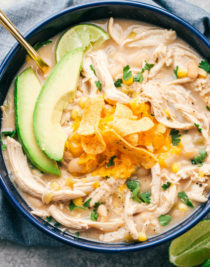 Don’t get me wrong, you are more then welcome to serve these Cheesy Chicken and Potato Foil Packs on a plate, but maybe make it a paper plate so you can clean up and recycle! 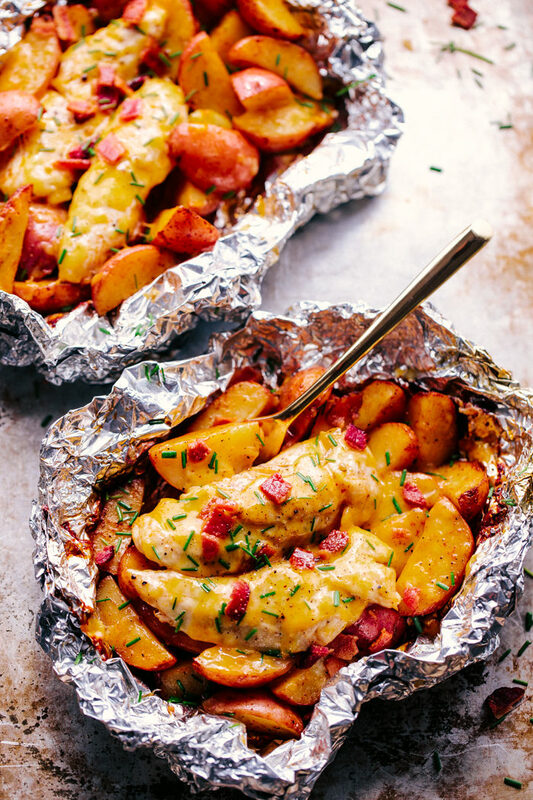 Kidding, either way foil packets are a fun and simple way to throw a backyard cookout for family and friends, not to mention, they are not only topped with gooey melted cheese, but also crispy bacon. 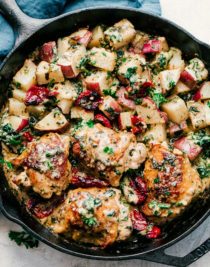 Yes, you can cook chicken and potatoes together. Start by cutting the potatoes in half or in quarters. Bring 4 quarts of water to a boil and then add potatoes. Boil for 4 minutes, drain and let cool. Add potatoes to the foil packs with the chicken. This will ensure the potatoes will cook along with the chicken to come out delicious. How do you make a foil packet? Making foil packets are very quick and easy. Start with an extra long piece of foil and fold it in half to make it sturdy. Spray the foil with nonstick spray to ensure your food doesn’t get cooked onto the foil. Place your potatoes and chicken in the center of the foil and bring up the sides to meet at the top. Fold the foil over to seal, then fold in the remaining two edges, but don’t seal too tight, you want the steam to be able to move around while the packet cooks. How long do you grill foil packets? 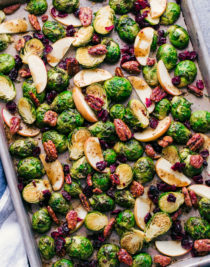 If you are using potatoes in your foil packets it is a good idea to boil them for 4 minutes first and then place them in your foil pack with whatever other ingredients you choose. This will help the potatoes to cook at an even rate as the rest of your food. For these Cheesy Chicken and Potato Foil Packs heat the grill to 450 degrees and cook for 20 minutes, until the potatoes are tender and the juices of the chicken run clear. Yes. 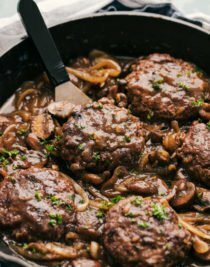 If you don’t want to use the grill or do not have access to one, you can create the same concept using your oven. Simply make your foil pack, spray with nonstick cooking spray and place your ingredients into the middle of the foil packet. Preheat your oven to 425 degrees and then place your foil packets on a rimmed baking sheet. Cook and then open very carefully being mindful of the steam in the foil pack. How do you make Cheesy Chicken and Potato Foil Packs? Boil cut potatoes for 4 minutes, drain and let cool. Using 3 large pieces of foil fold in half and spray with nonstick cooking spray. Place potatoes in a large bowl and melt 2 tbsp of butter. Pour over potatoes and add in garlic cloves, seasoning salt, black pepper, and paprika. Stir to combine and place even amounts into prepared foil packs. In the same bowl place chicken tenders and melt additional 2 tbsp of butter and pour over tenders. Season with seasoning salt and pepper. Stir to combine and add 2 tenders to each foil pack. Seal up and place on grill. 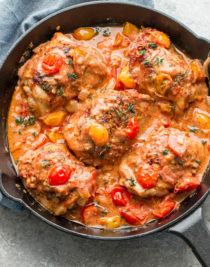 Cook for 20 minutes until chicken juices run clear. Turn grill off and carefully open packets, place 1 cup shredded cheese on top and close packets back up to melt cheese, about 2 minutes. Top with crumbled bacon and chives and serve. 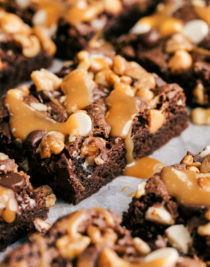 Are you in need of some easy recipes? 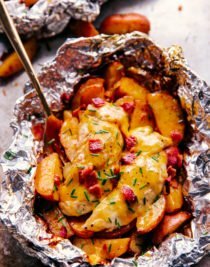 Cheesy Chicken and Potato Foil Packs are a fun and delicious way to turn your next meal into something cheesy, juicy and simple to clean up. No mess, no fuss when it comes to foil packs! Place potatoes in a large bowl and melt 2 tbsp of butter. Pour over potatoes and add in garlic cloves, add 1/2 tsp seasoning salt, 1/2 tsp black pepper, and paprika. Stir to combine and place even amounts into prepared foil packs. In the same bowl place chicken tenders and melt additional 2 tbsp of butter and pour over tenders. Season with remaining seasoning salt and pepper. Stir to combine and add 2 tenders to each foil pack. Seal up foil packs by bringing sides up and folding over to seal, roll up remaining two sides and place on grill. 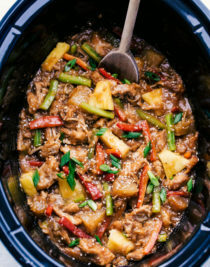 Cook for 20 minutes until chicken juices run clear.